The day we say goodbye to Gangharia, most of the morning was spent on the veranda, sipping tea, staring at the beautiful mountains as they went about the routine fashion show. We sat there filling up our memory with the sight, something to cherish till we come back. Then before we even realized, it was time to pack up and walk the 13 kilometers back to Govindghat. According to our initial itinerary, the plan was to visit the Valley of flowers a second time, but we decided to skip that and go to Auli instead, a skiing resort near Joshimath. This was one of the best decisions taken during the trip. We started by 8:45 from Gangharia and the downhill journey was quite easy and enjoyable. The mountain peaks on the way were crowned with snow which was slowly melting away as the day progressed. There were very few people climbing down at that time. We had the landscapes all for ourselves and the cameras were out, busy pixellating the scenes for posterity. Yuvarj was wondering why there are no fruit trees anywhere along the way. He was ready to climb and pluck apples even if there is an apple tree on top of one of the peaks. There is this Hindu mythological story about a God who keep saying "Thathasthu" (let it be) all the time. So elders generally warn the children to be careful what they wish for, even as a joke. Just in case this god say "Thathasthu" the same moment you wish for something, it will come true irrespective of the nature of the wish. Something like this happened with Yuvaraj as well. As soon as he wished for an apple tree, we spotted one just by the trail. There were three apples on it, but there was also a small house nearby. As he was about to run towards the tree, a person came out of the house and explained that the fruits are left alone for seeding. We had no choice but walk away... but we did find apples pretty soon - two for ten rupees! We were moving at a leisurely pace and reached the Gurudwara at Govindghat by 1 in the afternoon. 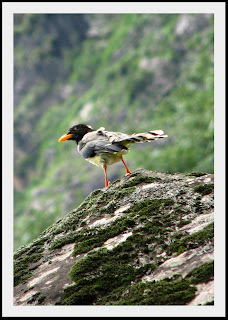 Rob and Subbu took all the stuff they had left in the locker room there and we proceeded towards Joshimath. The bus we took dropped us right in front of the GMNV guest house at Joshimath. We checked into the dormitory there and inquired about the cable car to Auli. We had bad news.. a minimum of 8 people were needed for the cable car to operate and there were no one else than us. Anyway we decided to try our luck and walked towards the ground station, a few minutes walk from the guest house. The story was the same - they refused to take just the 5 of us saying that the costs won't work out and the visibility is bad. But then we played the emotional card - how can they send 5 poor souls away like that, who traveled all the way from Bangalore for this one experience? So they agreed to take us up under the condition that we will get only 20 minutes to spend at Gorson, the last stop of the car. We were waiting to hear something like that and jumped at the opportunity. The cable car from Joshimath at 1,100 Mts (3608.90 ft) to Gorson at 3,016 Mts (9894.98 ft) covering the distance of 3.96 km, is the longest one in India. It used to be the longest in Asia, but not any more. There are total 10 towers and the car moves at a rate of 5 Mts/second, covering the distance in 15 minutes, one way. This was definitely a memorable ride of our lives with the view changing every meter of climb. The car passes above dense pine, almond and oak forests, many of the trees huge and hundreds of years old. Its a different feeling to fly above the canopy, seeing the forest from an altogether different angle. The snow covered peaks will surpass your best imagination. Though the visibility was bad about an hour ago, the mist was all gone suddenly.Even our guide was surprised as the previous two groups of tourists had returned without seeing anything but mist. 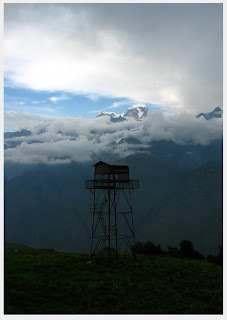 The skiing resort of Auli is at the 8th tower. There was no snow there at this time of the year but work was going on to create a new skiing track. The plan is to create artificial snow on the ski slopes in the event of low snow fall. Auli has the world's highest man made lake and the water from this lake will be used to feed the snow guns stationed along the ski slopes. Once you finally get down at gate 10 (Gorson), the view is astounding. Auli is blessed with a breathtaking panoramic view of the lofty peaks of the Himalayas. 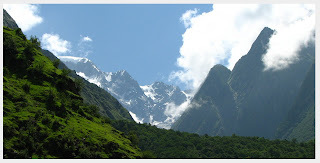 It is surrounded by high peaks like Mana, Kamet, Trishul, Dronagiri and tallest of all Nanda Devi. There are few other small peaks like the Hathi parvath, the sleeping beauty and others. Sitting there, staring at this beautiful mountain range was definitely the "Kodak moment" of the trip.. a fitting moment to reflect on ourselves and our nothingness in front of this new found grace and majesty. After a hot cup of coffee and many photographs, we finally returned to the base station. Joshimath aka Jyothirmath is the northern monastery, one of the four cardinal institutions established by Adi Shankara. We went to see the math and the caves where Sankara and his disciple Todakacharya meditated. There were also a couple of small temples nearby. After visiting the Shiva temple, we wound up the day's adventures. Badrinath, Mana and Vasudhara falls were on the cards for the next day and without wasting much time we settled down under the smelly mattresses for the night. Hi may I know when did your trip took place and will they allow people to stay @auli resort?? Hey Dhileep, the trip was in August 2009. There are accommodation facilities at Auli, but for us it was just a stopover. 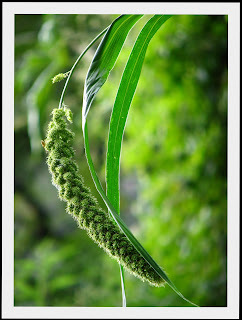 nice write-up..we too planning for valley of flowers in Aug ..Howz stay at GMNV ..was it reliable and safe? @Shraddha: You have dorms and rooms there. Pretty safe I say. Have a good trip.